Why are there military planes flying over Cape Carteret? The Town of Cape Carteret is located in very close proximity to several military bases. The closest of these military bases is the Marine Corps Auxiliary Landing Field in Bogue -- more commonly known as Bogue Field -- just east of Cape Carteret. It is not uncommon for residents and visitors to see military aircraft flying over the town. What does the military do at Bogue Field and why is it important? Bogue Field is maintained by the Marine Wing Support Group 27 and is used by the 2nd Marine Aircraft Wing to practice expeditionary airfield procedures. Bogue Field is one of only two places in the U.S. where AV-8B Harriers can practice field carrier landings in realistic conditions. These simulations are possible because the deck lighting and simulated superstructure provide the same landing cues as if the pilot were landing on a ship. The field is also used by rotary wing aircraft. What are Accident Potential Zones? Accident Potential Zones are "areas immediately beyond the ends of runways and along primary flight paths and are subject to more aircraft accidents than other areas." There are several designations within an APZ. The Clear Zone is the designated area adjacent to the runway along the flight path of approaching and departing aircraft, where the risk to humans and/or property from an aircraft accident, if one were to occur, is the greatest. Accident Potential Zone I is the designated area adjacent to the Clear Zone on the side farthest from the runway along the flight path of approaching and departing aircraft, where the risk to humans and/or property from an aircraft accident, if one were to occur, is less than in the Clear Zone. Accident Potential Zone II is the designated area adjacent to APZ I on the side farthest from the runway along the flight path of approaching and departing aircraft, where the risk to humans and/or property from an aircraft accident, if one were to occur, is less than in the Clear Zone or APZ I. Cape Carteret is primarily in APZ II and no properties in the town are within the Clear Zone. Residents, property owners, visitors and prospective property owners should be aware of these factors. Since 1974, the Department of Defense has been using the Day-Night Average Sound Level (Ldn) noise descriptor. Noise Exposure Levels are classified into three levels. Noise Exposure Level N3 (75 Ldn or higher) is the area of greatest impact. Noise Exposure Level N2 (65 to 74 Ldn) is the area of moderate impact. Noise Exposure Level N1 (below 65 Ldn) is the area of least impact. Cape Carteret is primarily in the 60 to 65 Ldn zone which means properties within these areas will experience a low to moderate impact from aircraft noise. Residents, property owners, visitors and prospective property owners should be aware of these factors. What is the Eastern Carolina Joint Land Use Study? In 1973, the U.S. Department of Defense established the Air Installation Compatible Use Zones program to promote community growth which is compatible with present and future military installation operations. The program examines existing land uses, growth projections and recommends compatible growth patterns based on noise contours and accident potential zones from current and projected aircraft activities for that facility. Because the recommendations from the AICUZ studies are not binding on communities and may not be included in local planning activities, some communities and installations have begun to work together to develop a Joint Land Use Study to help resolve the conflict that may occur between the base's mission objectives and local community growth patterns. The Eastern Carolina Joint Land Use Study is a result of communities in eastern North Carolina coming together to work with Marine Corps Air Station Cherry Point to establish land use guidelines and development regulations for the properties within the AICUZ footprint affected by MCAS Cherry Point, Marine Corps Auxiliary Landing Field Bogue and Marine Corps Outlying Landing Field Atlantic. Craven County, Carteret County, the City of Havelock and the Towns of Emerald Isle and Bogue, as well as the State of North Carolina, jointly created the ECJLUS. How does a citizen register a complaint regarding aircraft noise or safety? The public should refer complaints regarding MCALF Bogue to Cherry Point's Air Operations Office at (252) 466-1092. The Operations Duty Officer will notify the Community Plans and Liaison Officer who will contact you regarding your complaint. All complaints are investigated. 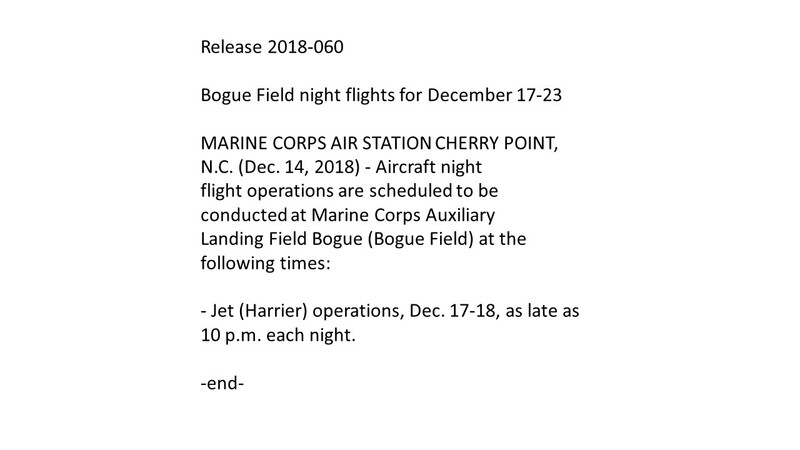 This information was contributed by The Town of Emerald Isle as well as the Marine Corps Auxiliary Landing Field in Bogue.